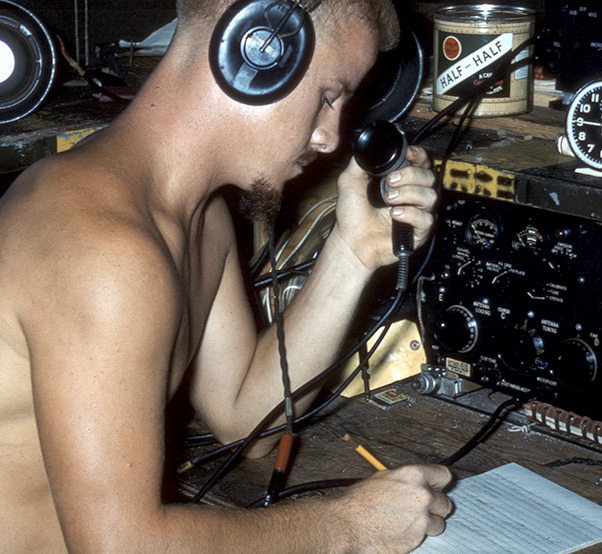 Airman 2nd Class Bob Cunningham, of the 1374th Mapping and Charting Squadron, operates radar equipment on North Danger Island in 1956. The tiny island in the South China Sea, located midway between the Philippine Islands and Vietnam, became an important station during an Air Force project to accurately map the world using aerial electronic geodetic survey. The processed data would eventually benefit intercontinental ballistic missile targeting. For six months in 1956 Bob Cunningham, a former Air Force radar operator, lived on a remote knob approximately 2,000 feet long and 850 feet wide in the Spratly Islands group located midway between the Philippine Islands and Vietnam. His home was a canvas tent and he manned radio and radar equipment for a secret Air Force project mapping the earth. Cunningham’s first duty station was a tiny, oblong blister of land in the South China Sea. He knows it as North Danger Island. It was a ‘million dollar experience’ that he wouldn’t give two cents to repeat, Cunningham said jokingly. Cunningham’s four-man team and all their equipment was brought in by helicopter to the island from the deck of a Landing Ship Tank, along with the drinking water, fuel and rations the men would need to survive. Resupply occurred every four to six weeks by helicopter, supplemented by occasional parachute drops. A radio relay team of six Airmen had already established itself on the island and shared the same copse of trees. He was an Airman 2nd Class, with just over a year of service in the Air Force and some college education. His sergeants had seen combat during World War II and were wise to what the isolated team would endure. Their ingenuity, humor and direct leadership kept young Cunningham and the others on the island from mentally cracking. To keep a low profile, the Airmen were ordered to stow their uniforms and wear civilian shorts and sneakers, sandals and cowboy hats instead. The men also kept their pistols and M-1 Garand rifles ready, knowing that pirates and other possible threats roamed the waters surrounding them. 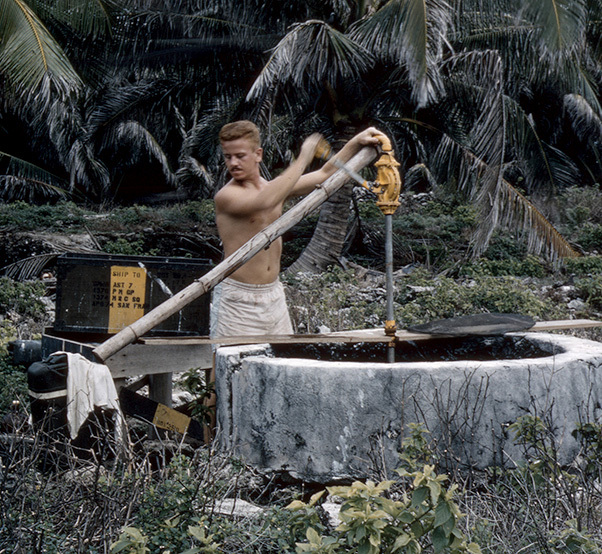 Airman 2nd Class Bob ‘Red’ Cunningham, of the 1374th Mapping and Charting Squadron, pumps water from an old well on North Danger Island in 1956. The Airmen only used this for laundry and washing. 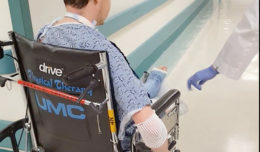 Drinking water was delivered in 55-gallon barrels. 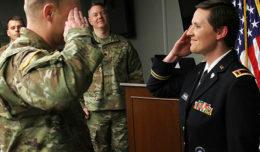 The veteran sergeants kept up morale in other ways. They improved the camp with funny signs, handmade furniture and a wind-driven water pump. 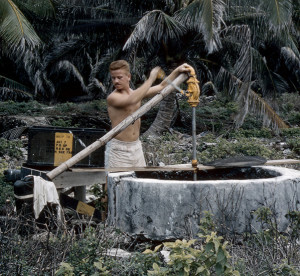 They cooked sea turtles for the men, and they improvised a way to make alcohol from coconut juice and cake mix. Cunningham said his experience on the reef forever changed how he relates to other people.